Until relatively recently in human history, our observational capacity from Earth has been rather limited. Presently technological advancements and innovations have arisen allowing us to uncover and understand more of the mysteries and intricacies of the universe. Recent observational research initiatives have led to the discovery of planets outside our solar system, known as exoplanets. These discoveries have raised many questions including whether or not any planets would be capable of supporting life, which has fueled motivation for additional research. This is a great example of the natural progression of scientific discoveries leading to additional inquiries and further research as demonstrated through the scientific method. In order to fully comprehend how it is we are able to know that there are planets outside of our own solar system, we must consider how scientists discover them. 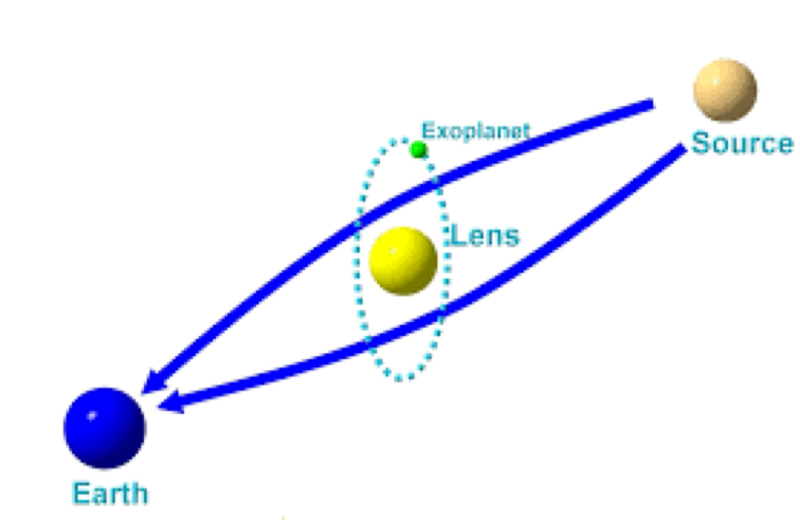 Several techniques have been developed to detect exoplanets, including the radial velocity method, transit photometry, direct imaging, and gravitational lensing. To better understand the observational techniques as well as their advantages and disadvantages, these methods are discussed in the order of their development and successful implementation. Figure 1 gives a sense of the accomplishments of the methods used so far. Credit: Las Cumbres Observatory Global Telescope Network. As you can see from Figure 2, when the star moves away from us on earth, the light waves emitted by the star are stretched and therefore move toward the red end of the spectrum, which is referred to as red shift. Conversly, when the star moves towards us on earth, the light waves emitted by the star are compressed and therefore more towards the blue end of the spectrum, which is called blue shift. The spectrographs used to detect these changes are extremely sensitive with some instruments able to detect velocities as low as 1 meter/second.7 If the star exhibits periodic red and blue shifts over a period of time, astronomers infer that the star is moving due to the gravitational force from another object or objects. 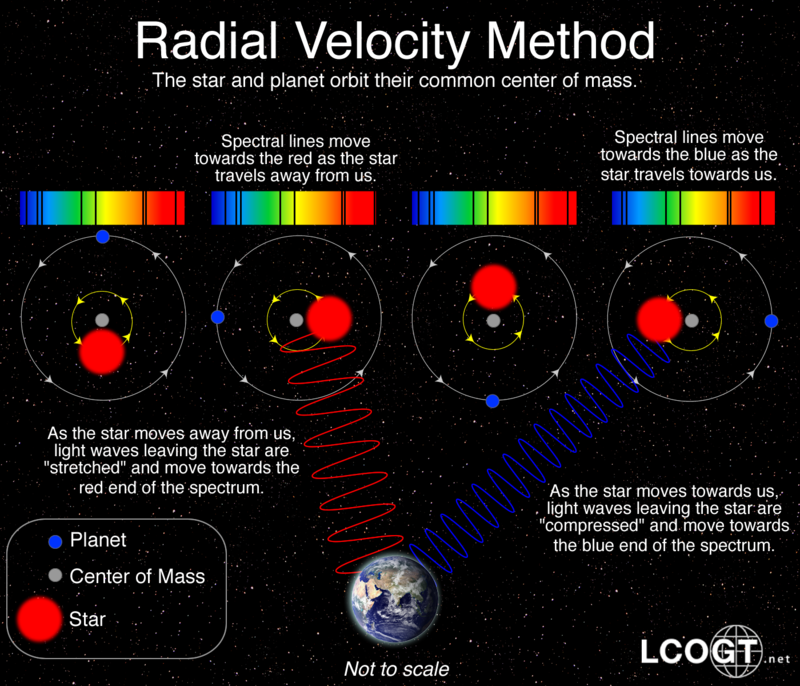 The radial velocity method can also only detect planets about 100 light years away from earth since the observed light, broken down into it’s spectrum, spreads out and makes it harder to detect. This is less of a problem for large telescopes, but such instruments can be very expensive and hard to come by as there are only a few and they are sought after by astronomers for many other applications. Direct imaging is very simply put, observing exoplanets with an exceptionally high-tech telescope. Normally due to the faintness of the planets themselves, they are very difficult to observe optically. Some exoplanets however can be imaged in the infrared range of the spectrum as they are still retaining heat left from their formation. The heat is emitted as thermal radiation, which registers in the infrared range. Fig 5. 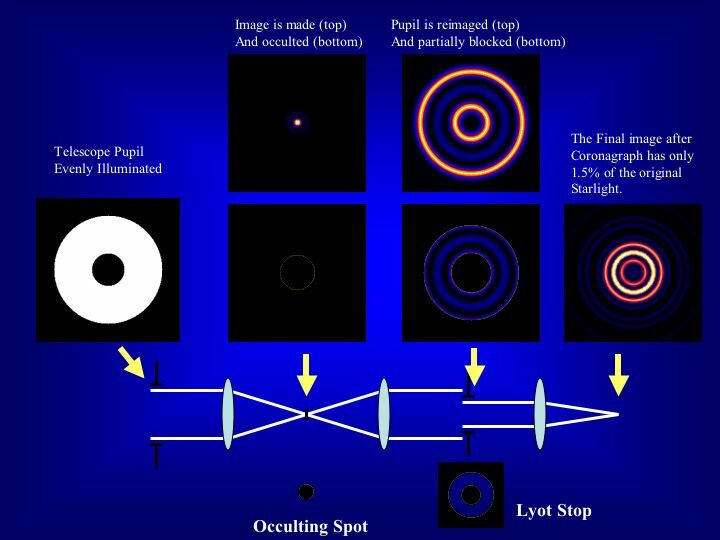 How a Lyott coronagraph works. This technique was originally designed to allow view of the heat rings around the sun. 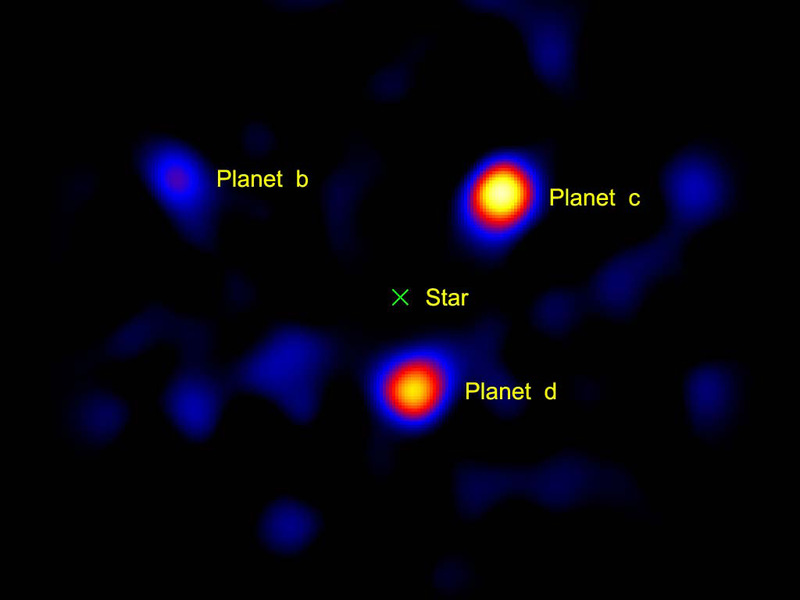 For the purpose of detecting exoplanets, this technique may render previously washed out exoplanets visible allowing the direct imaging method to be more productive in detecting exoplanets. In addition to its at times cumbersome detection efficacy, direct imaging often produces distorted images. The distortion can be caused by temperature differences that cannot be alleviated even with the use of a coronagraph or disruption from atmospheric turbulence. More recently, advancements in adaptive optics have been developed to mitigate such interferences12 and functionality of the method can improve when used via the Hubble Space telescope, but this inevitably makes it more expensive. Without the aid of a coronagraph, direct imaging is not a good candidate for large-scale surveys searching for new exoplanets. Fig 7. 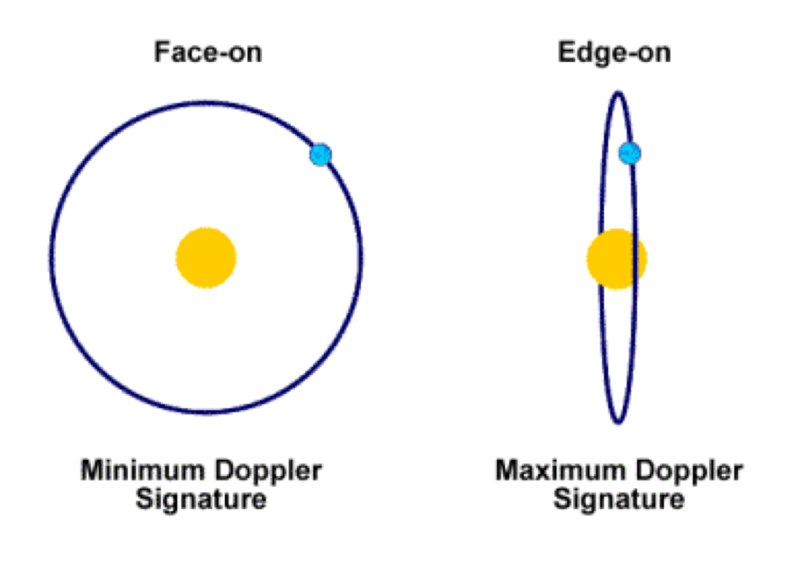 Diagram which contrasts a face-on and an edge-on orbit. In order to gather any information, any transit (which are often short) must also be witnessed—which requires constantly monitoring the sky waiting for a transit. It is also impossible to draw any meaningful conclusions from a transit—at least three must be observed to conclude that the object in question is actually a planet and not some other astronomical phenomenon. 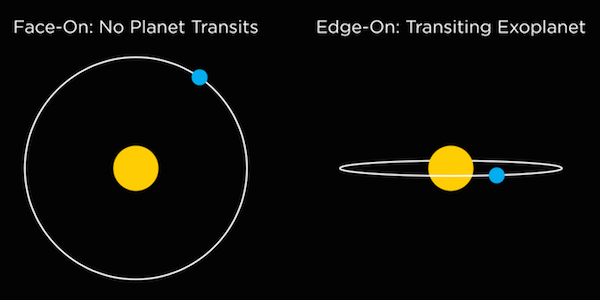 Many phenomena observed by transit photometry are eventually determined to not be exoplanets. Fig. 8 Diagram which shows light originating from a source star and being bent by a lens star as the light travels to Earth. Gravitational lensing is based on Einstein’s general theory of relativity. One of the consequences of the theory is that as light travels past a celestial body, that body’s gravity will bend the light ever so slightly. Gravitational lensing applies this to detect an increase in the brightness of a distant star incredibly far away from Earth that a planet happens to pass in front of. The process involves two stars—one far away (the source star) and one closer to Earth (the lens star)—and a planet which orbits the lens star. If these two stars line up from the perspective of Earth, the light emitted by the source star will be bent by the lens star. Like all methods of discovering exoplanets, gravitational lensing has inherent advantages and disadvantages. It can be used to discover planets incredibly far away from Earth—sometime thousands of light years away.16 Since gravitational lensing boils down to setting up a large telescope and watching for changes in flux measured, it is possible to examine massive search areas. We are essentially targeting tens of thousands of stars at the same time. However, the nature of the method has specific draw backs, particularly concerning repeatability and the accuracy of measurements. Due to the particular conditions that need to be met (that a lens star, with a planet, and source star line up from our perspective on Earth) to detect an exoplanet through gravitational lensing, it is unlikely to repeat these observations after stars fall out of alignment. If scientists’ measurements are even slightly inaccurate any error is greatly amplified and the results will not correspond to reality in any meaningful capacity. 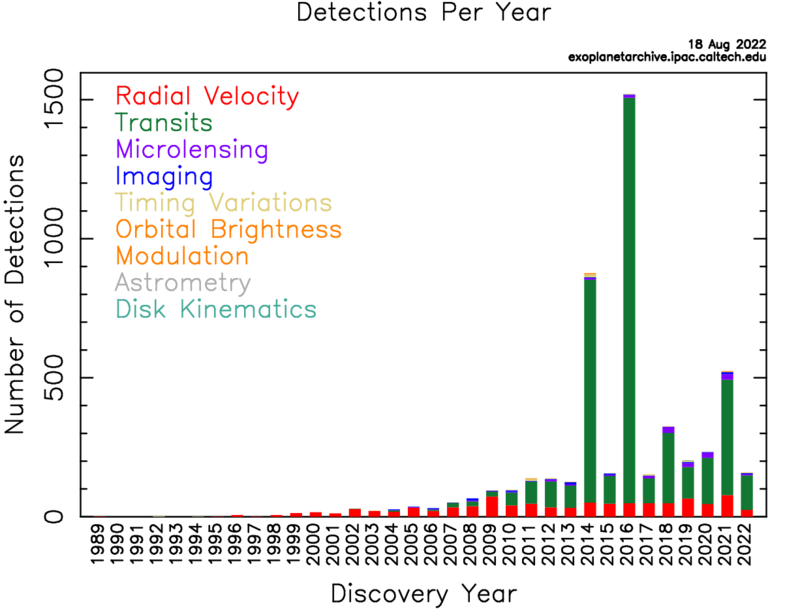 Gravitational lensing, radial velocity, transit photometry and direct imaging are the most common methods used to detect exoplanets in the twenty-fitst century. These four processes all have major strengths and weakness and can sometimes be used to complement each other in the search for exoplanets. For example, radial velocity gives mass, transit gives size, so combining we get density, from which we can infer physical properties such as the chemical composition. In the quest for discovering more about the universe, each method gives us a piece of the greater image. Currently, we are finding small pieces of a remarkably vast universe and will no doubt bear witness to even more extraordinary discoveries in years to come. 1NASA Exoplanet Science Institute, NASA Exoplanet Archives, WWW document, (http://exoplanetarchive.ipac.caltech.edu/exoplanetplots/). 2D.E. Gary, Search for Extrasolar Plaents, WWW document, (https://web.njit.edu/~gary/320/Lecture10.html). 3F. Chou & M. Johnson, NASA’s Kepler Marks 1,000th Exoplanet Discovery, Uncovers More Small Worlds in Habitable Zones, WWW document, (http://www.nasa.gov/press/2015/january/nasa-s-kepler-marks-1000th-exoplanet-discovery-uncovers-more-small-worlds-in). 4The Planetary Society. Radial Velocity, WWW document, (http://www.planetary.org/explore/space-topics/exoplanets/radial-velocity.html). 5B. Mattson, Doppler Shift, WWW document, (http://imagine.gsfc.nasa.gov/features/yba/M31-velocity/Doppler-shift-2.html). 6Las Cumbres Observatory Global Telescope Network, Radial Velocity Method, WWW document, (https://lcogt.net/spacebook/radial-velocity-method/). 7J. Stromberg, How do Astronomers Actually Find Exoplanets?, WWW document, (http://www.smithsonianmag.com/science-nature/how-do-astronomers-actually-find-exoplanets-180950105/?no-ist). 8B. Beky, Ph.D. dissertation, Harvard University, 2014, Retrieved from http://arxiv.org/pdf/1408.0401. 9H. Osborn, Kepler’s Last Stand: Verification by Multiplicity, WWW document, (http://www.hughosborn.co.uk/author/hposborn/). 10R. Whatmore, Portrait of Distant Planets, WWW document, (http://www.nasa.gov/topics/universe/features/exoplanet20100414-a.html). 11The Planetary Society. Direct Imaging, WWW document, (http://www.planetary.org/explore/space-topics/exoplanets/direct-imaging.html). 13J.D. 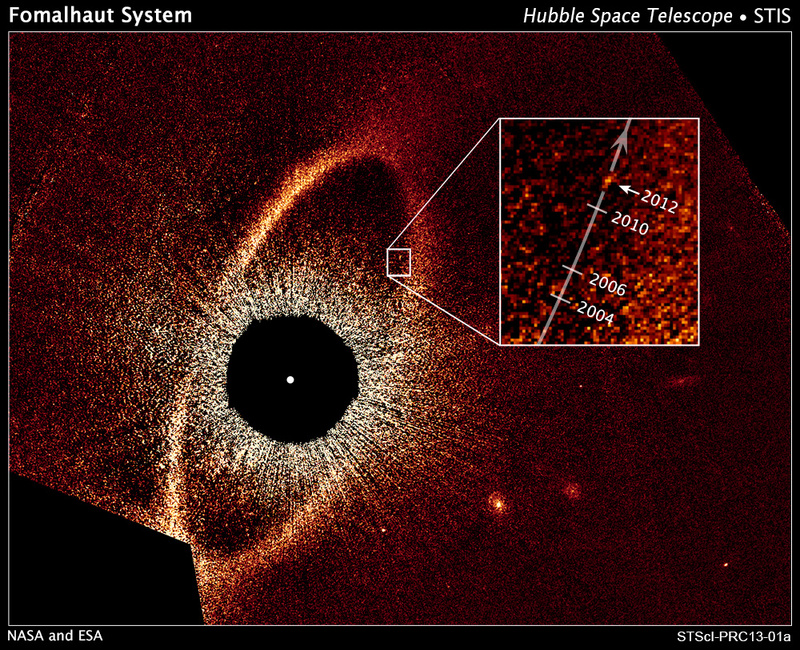 Harrington, NASA’s Hubble Reveals Rogue Planetary Orbit For Fomalhaut B, WWW document, (http://www.nasa.gov/mission_pages/hubble/science/rogue-fomalhaut.html). 14Planetary, Transit Photometry, WWW Document, (http://www.planetary.org/explore/space-topics/exoplanets/transit-photometry.html). 15I. Waldmann, L11: Finding Exoplanets: The Transit Technique PDF document, (http://zuserver2.star.ucl.ac.uk/~ingo/Lecture_Notes_files/lect11.pdf). 16Planetary, Microlensing, WWW Document, (http://www.planetary.org/explore/space-topics/exoplanets/microlensing.html).